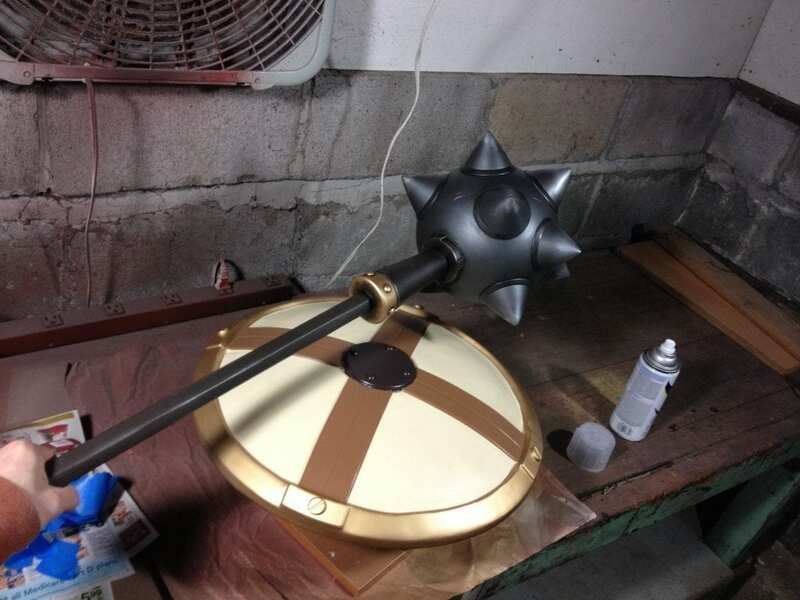 Back in December, I got a messaged from famed cosplayer Jessica Nigri about the possibility of getting a mace and shield build for an upcoming costume of hers. Of course I jumped at the chance to make a set of weapons that are so EPIC! Also, You can check out my video build playlist here! This build was a pretty big departure from my traditional space pistols and daggers, so I did a LOT of planning! I knew that it needed to be durable for convention usage as well as fairly light weight. I spent a day or two drawing up some extremely detailed blueprints. 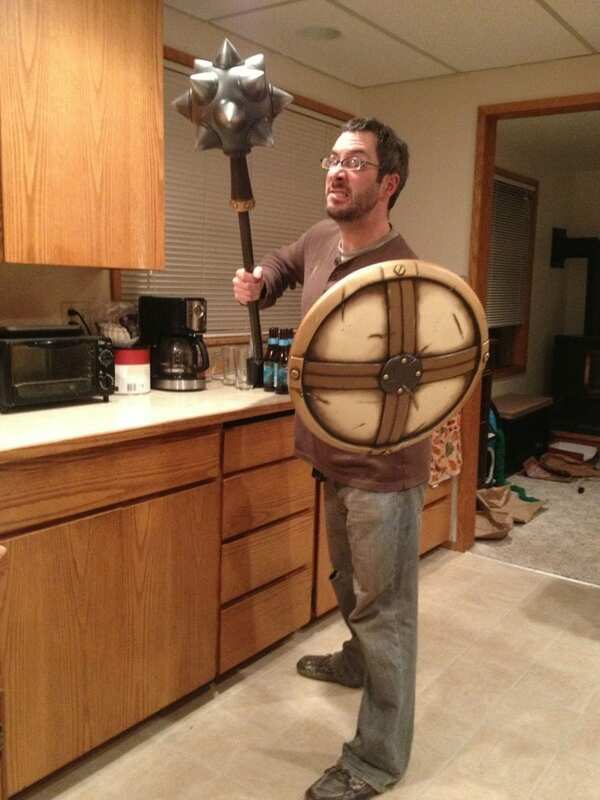 The dome shape of the mace was built out of 8″ acrylic light globes from Home Depot. 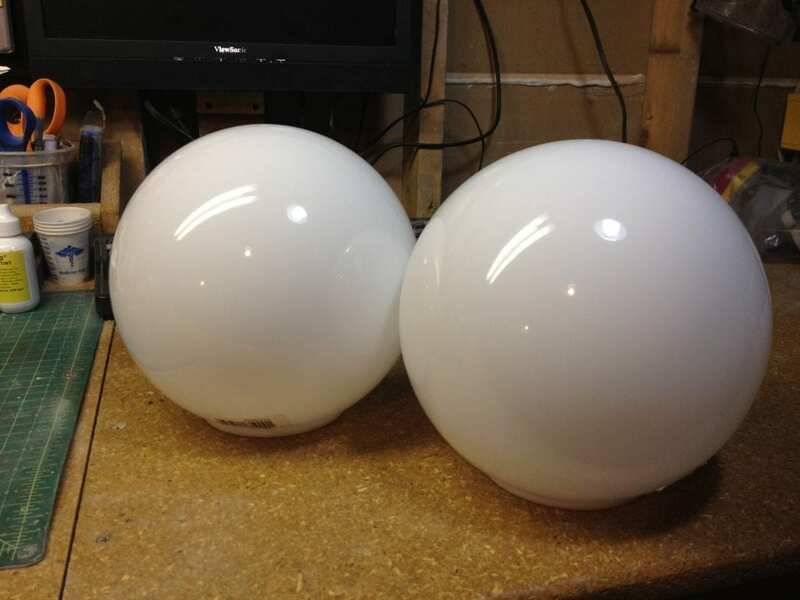 I got two of them incase I broke one and I needed some spare material to account for the light fixture lip on the bottom of the dome. 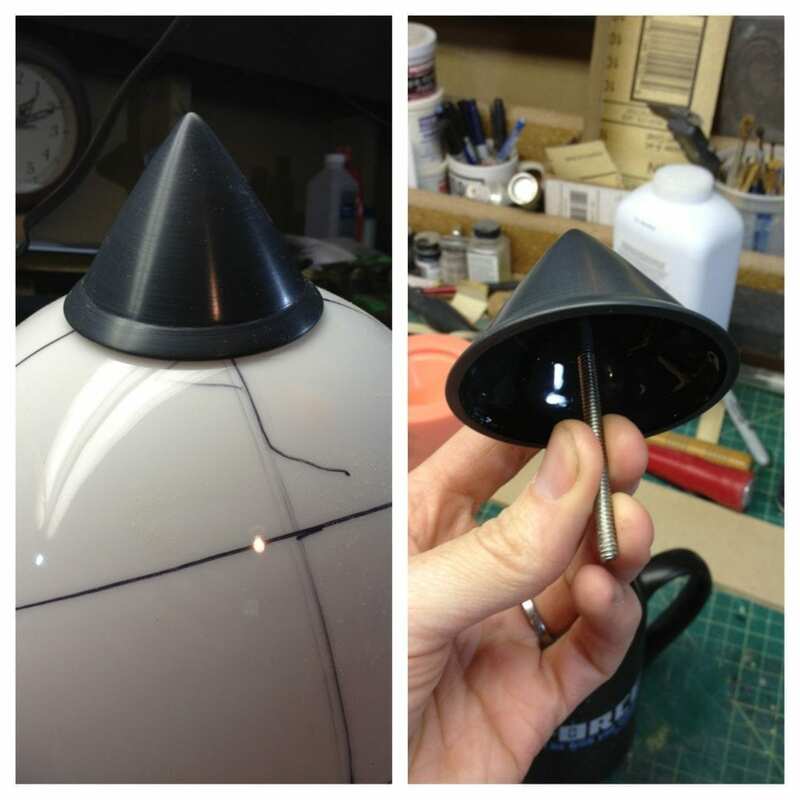 The spikes were molded and I lathed the master from plastic resin that was originally cast out of a funnel to save on materials and lathing time. I needed 13 of them for the whole mace. One of the trickier parts of this build was figuring out the spacing on the dome for all of those spikes. 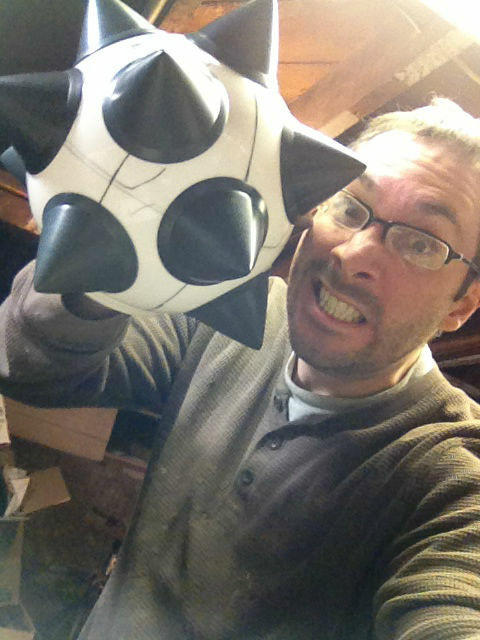 Also tricky: not bashing a hole through the acrylic sphere while drilling holes for the spikes. 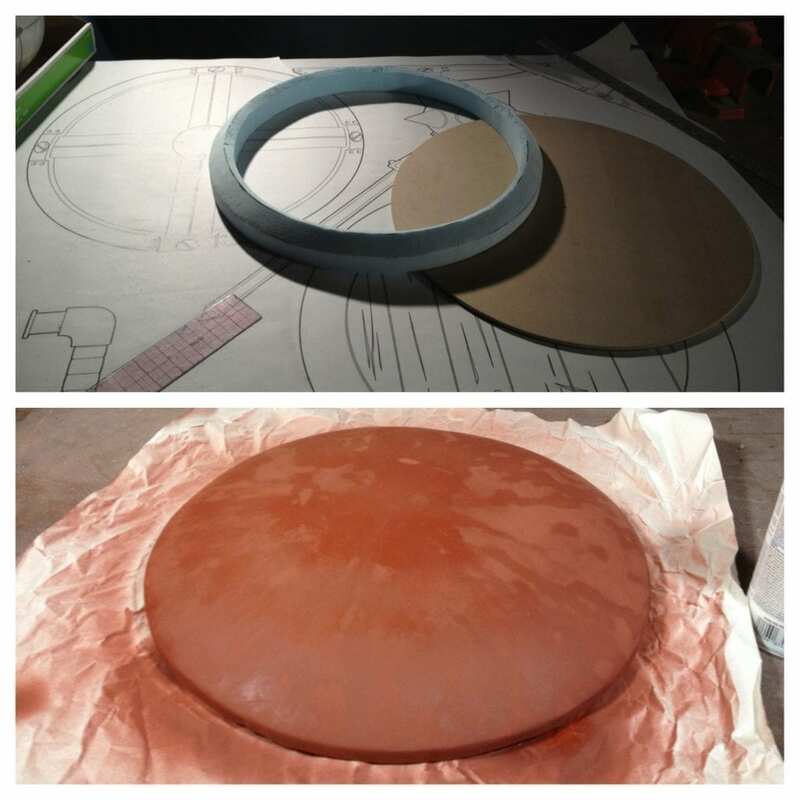 I started the shield shape by making a cross section from MDF wood and filling in the quadrants with rigid insulation foam. The shape was then cut with a coping saw, carved with a rasp, and sanded. 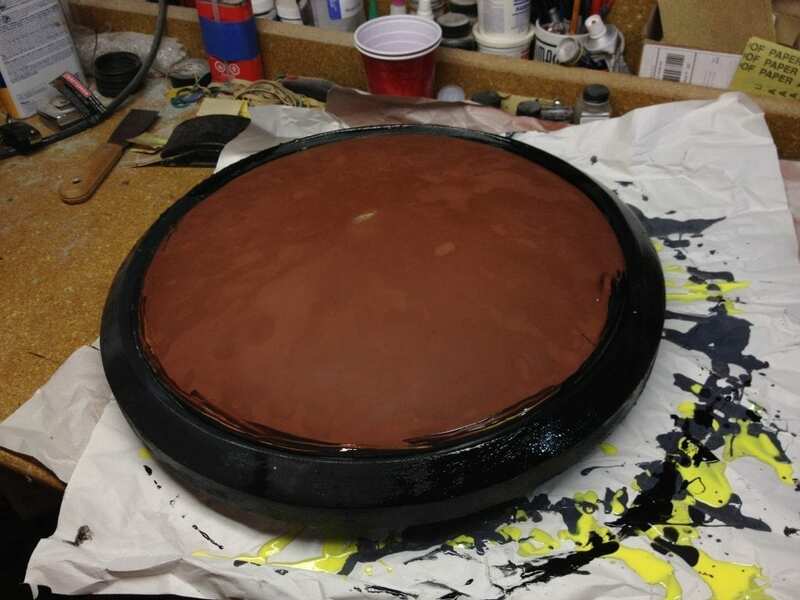 Then I coated the shield shape in several coats of polyurethane plastic resin. 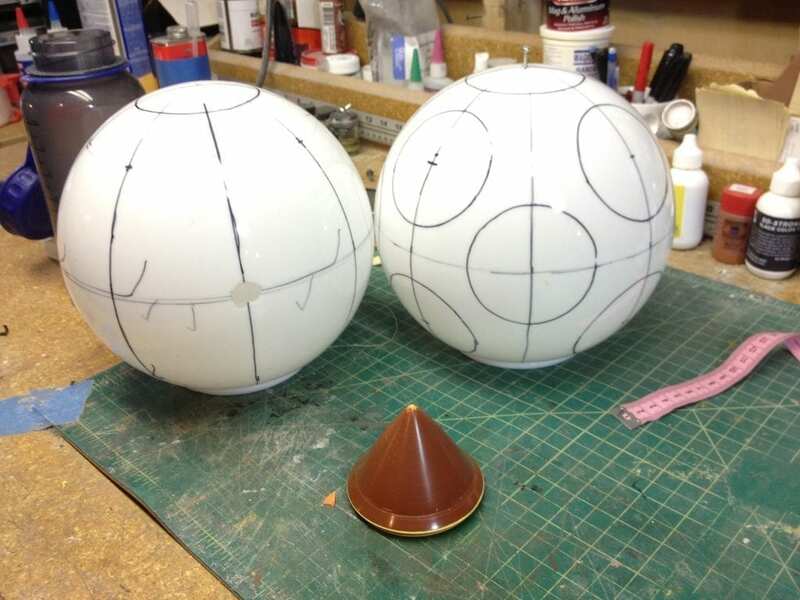 These layers of plastic got sanded, shaped, and filled with Bondo until I had a form that I was happy with. 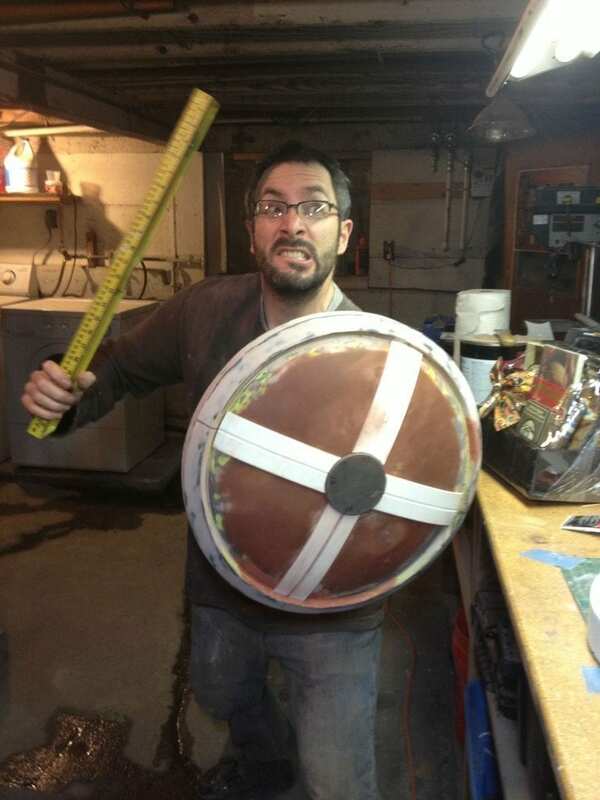 After the shield dome shape was good, I cut out the outer lip of the shield, also from insulation foam. 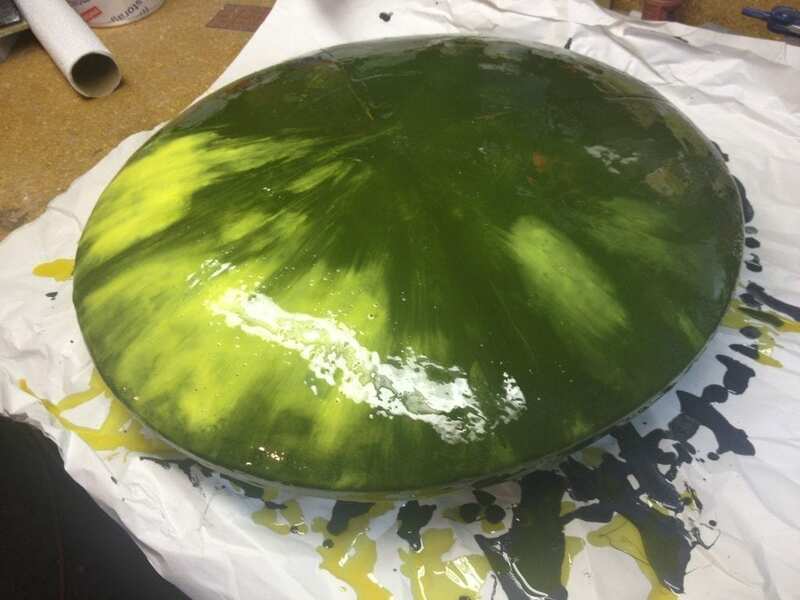 This was glued to the inner dome and also skinned in resin, sanded, and filled. 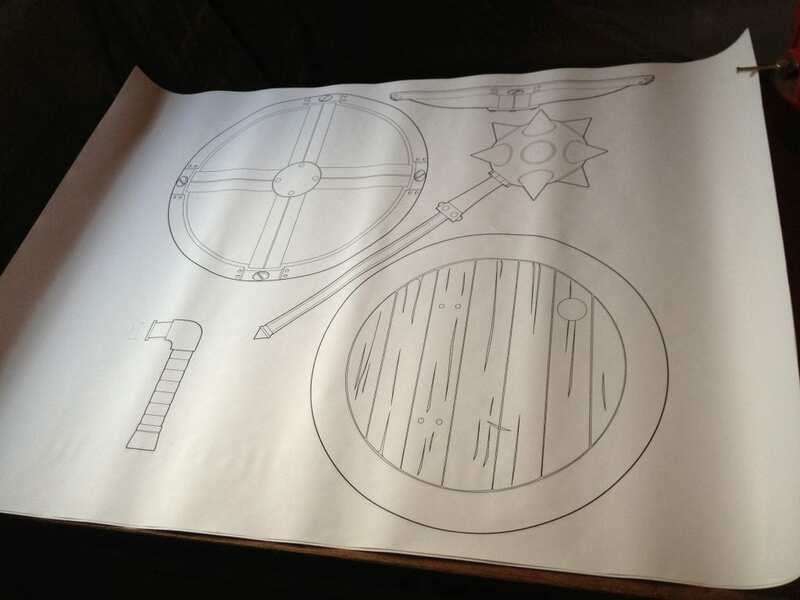 The cross pieces of the shield were cut from varying thicknesses of foam PVC. 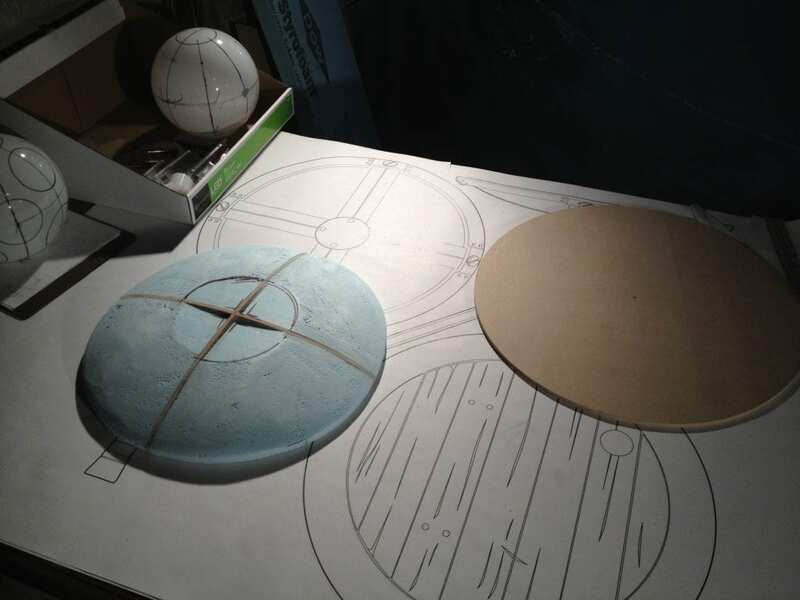 The center circle piece was 1/4″ thick and glued down to the center. 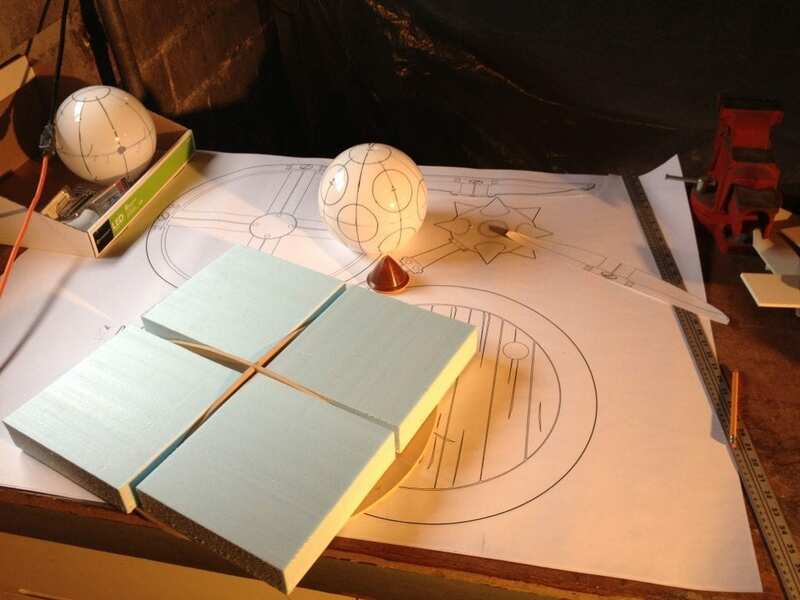 The cross strips were 1/8″ thick and were heat formed to the contour of the shield. These were also glued down. At this point I was feeling particularly badass. 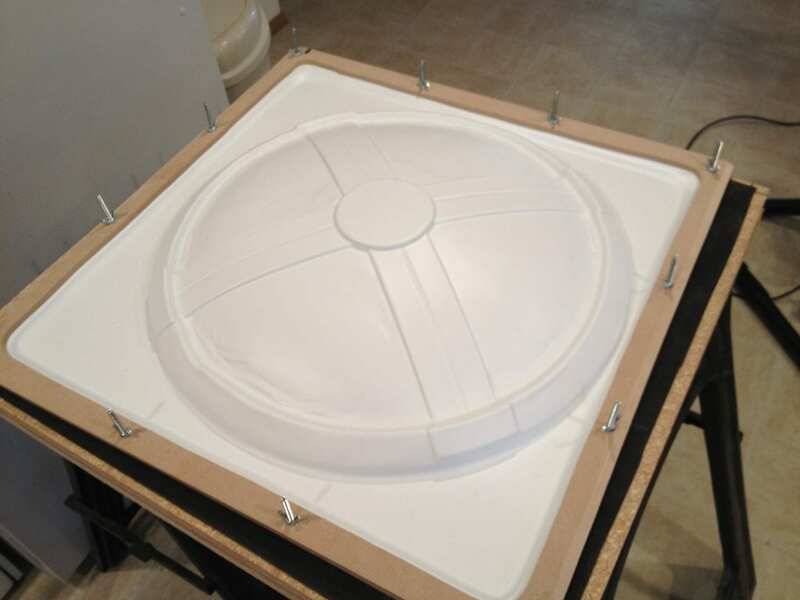 Since this shield needed to be lightweight and durable, I decided to vacuform it from high impact styrene. That meant that I needed a new vacuform table! 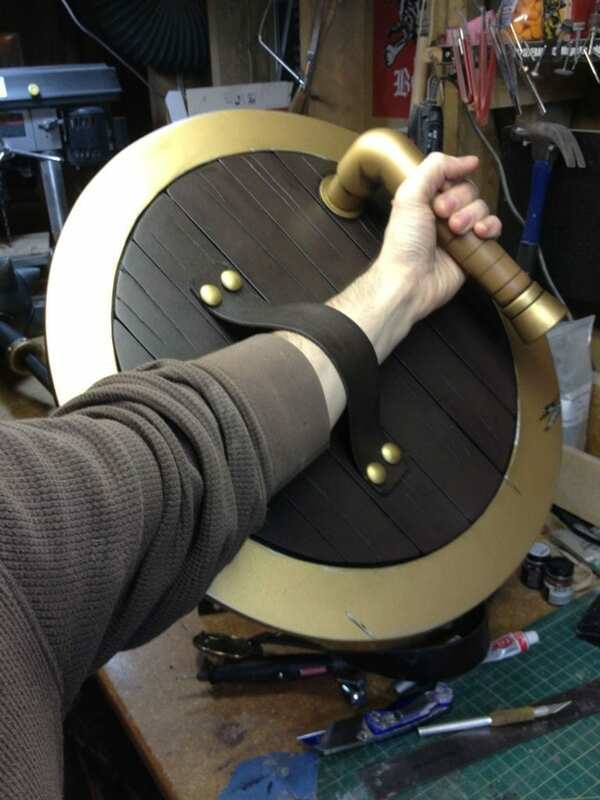 The shield handle was made from some PVC pipe and pipe fixtures. 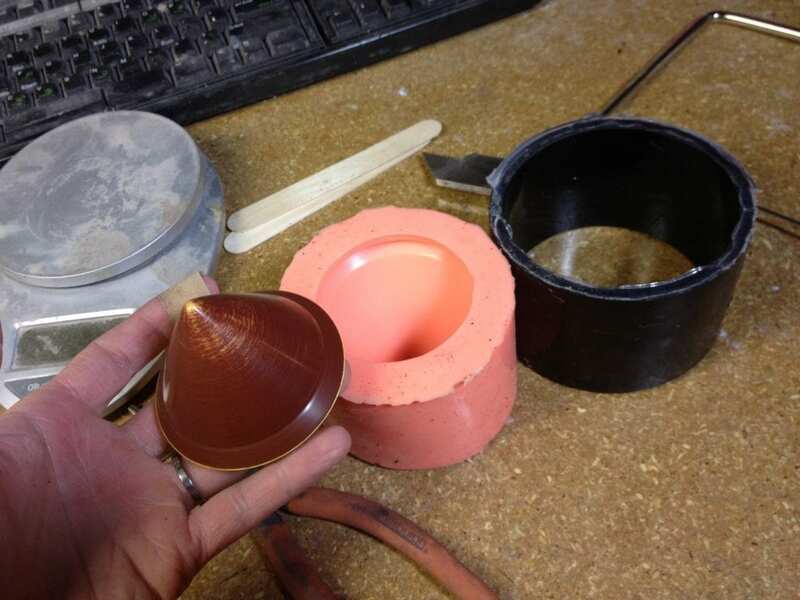 The yellow bit on the pommel end is more polyurethane plastic resin that I cast on the end of the tube and spun around the lathe. 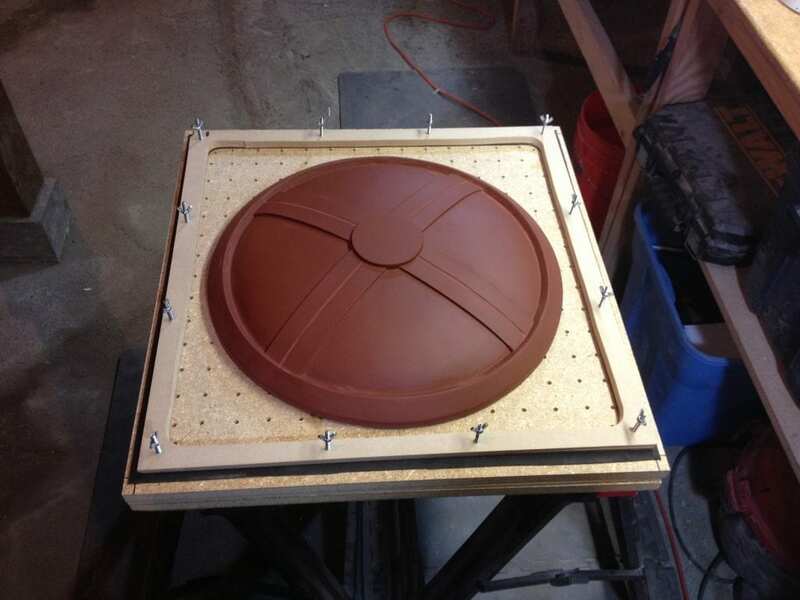 All of the back side of the shield was attached to a circle of 1/4″ MDF wood. 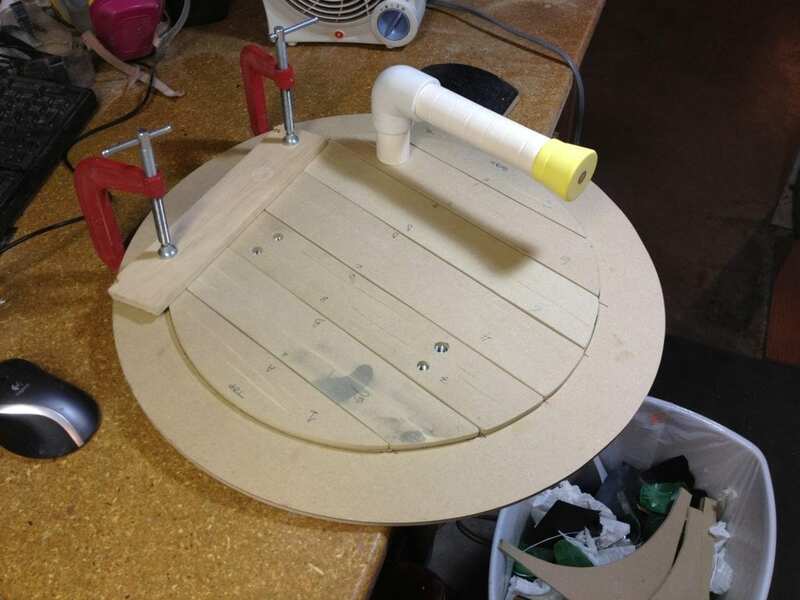 The planks on the back were also 1/4″ MDF that I carved some grain lines in with my Dremel. I put T-nuts in the back piece for attaching the strap and handle later. 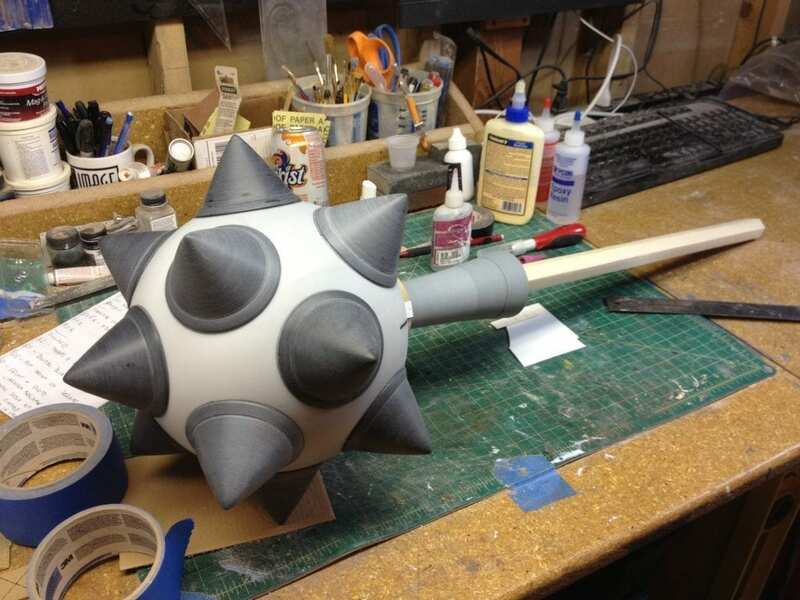 With the mold made for the mace spikes, I slush cast them from plastic resin, adding a bolt with the last layer. This way the spikes could be bolted into the dome head. Suddenly I realized that the deadline was looming, so I didn’t take very many photos, but I will do my best to paint you a word picture. The shaft is a 1-1/8″ wooden dowel. The hexagon shape was achieved with a belt sander. 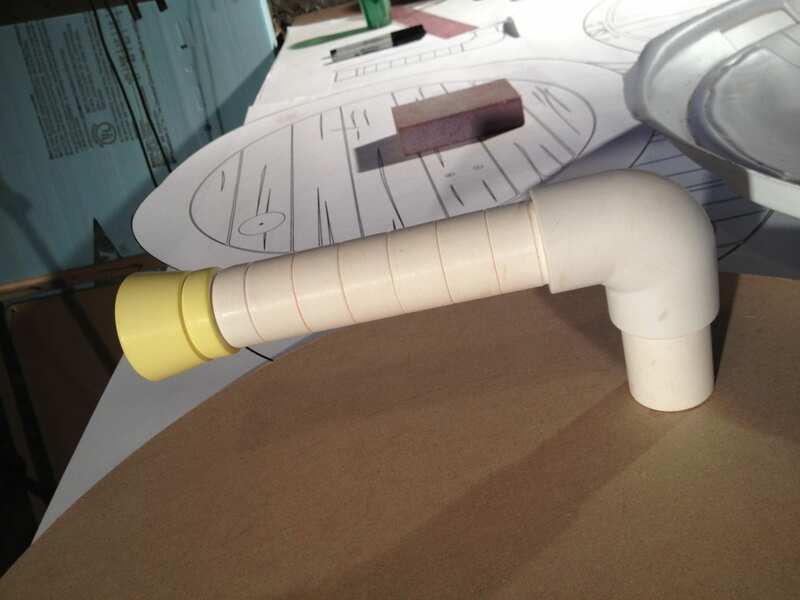 The small collar on the top of the shaft was two pieces of 1/4″ MDF with 4 faceted pieces of styrene. The tapered cone thing near the top of the shaft is polyurethane plastic resin that was cast around a PVC tube and turned on the lathe. All of this stuff was glued to the dome. The pommel of the spike was also a lathed piece of plastic resin that was bolted into the bottom of the shaft. 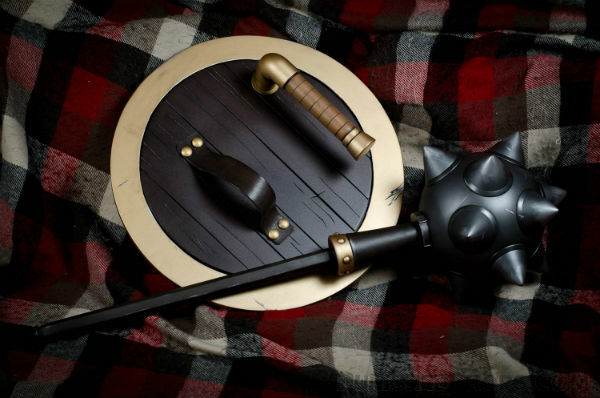 All of the rivet pieces on both the mace and shield were furniture tacks. 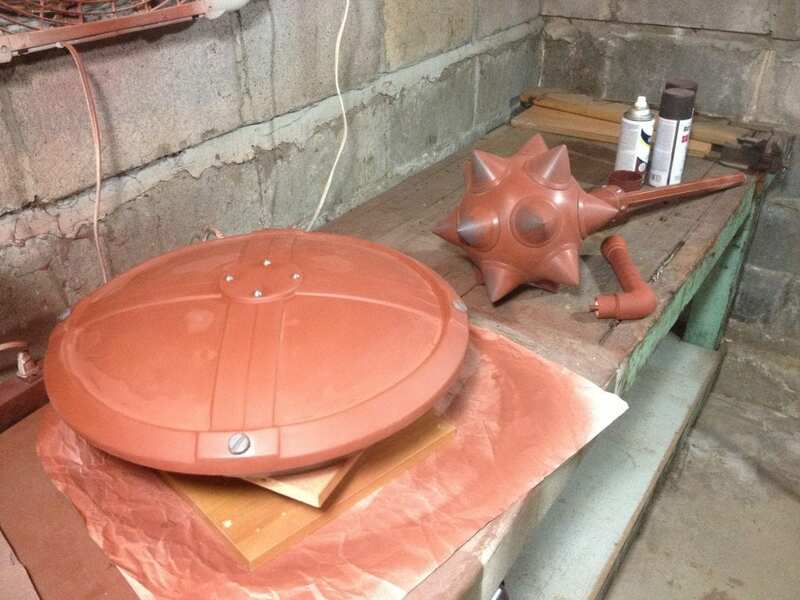 The screw pieces on the shield were cast plastic from a simple clay push mold. The deadline was looming at this point! GET IT PRIMED! 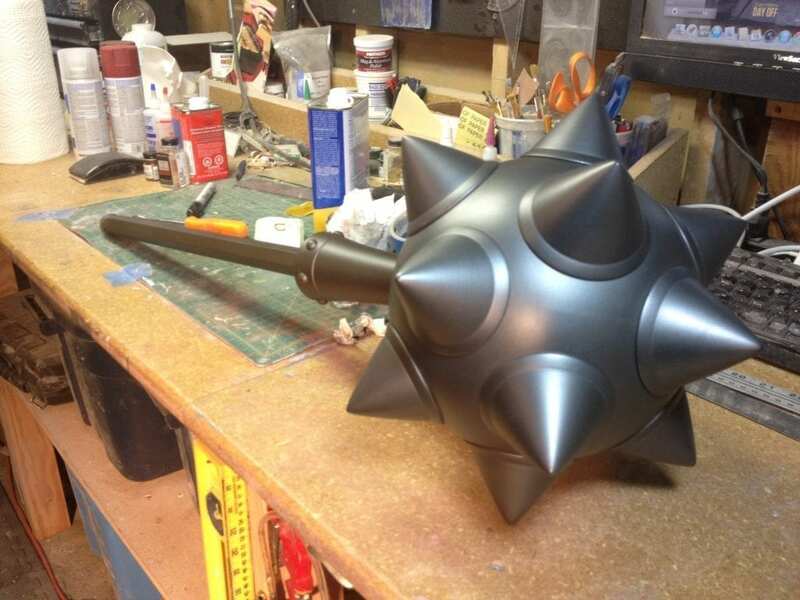 Most of the metal looking parts on the mace were painted with an airbrush “metalizer” lacquer. 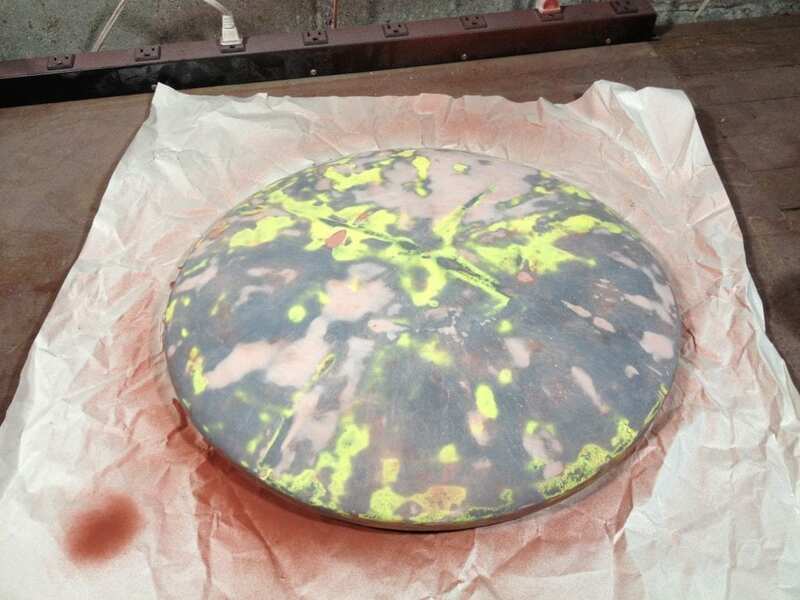 After spraying it, I buffed it with a cloth and it looks wicked awesome. After that, everything got painted. I also didn’t take any photos here, but most of it was masking, rattle cans, clear coats, and then weathering! The back of the shield got a repurposed leather belt as a strap and voila! It is done!